Is this the Figaro III? Unless I was in boat heaven or something... But remember seeing a LOT of Figs. So more technical sailing due to assym, more demanding, more one design, more wet. Tip and Shaft newsletter has a section about the boat, discussing speed foils and sails. Conrad is on Figaro III No.40. I thought the progression in the FR sailing world was the other way but I guess you can't skip a step for too long. Should be good! Below is a Google Translate of the Tip & Shaft article mentioned by Leo. There are a few things mentioned that I have long been concerned about: 1)The lack of ballast means the boat performs poorly beating into the wind. (I don't know about you but I spend most of my sailing beating into the wind, so this is of upmost importance to me.) 2)The lack of ballast means the boat will perform poorly in rough waves. (Isn't the Bay of Biscay notoriously rough?) 3)An asym spinnaker gives it a gybing angle of 80-90 degrees. (When designing the Figaro 2, the skippers specifically wanted to be able to sail deep down wind.) 4)Problems with the foil. (A bad design when they could have gone with the DSS which is much simpler) It looks like this boat was designed for a beam reach and nothing else. I am thourghly not convince on this boat. Since last January 7th, 49 copies of the new Figaro Bénéteau 3 have been delivered to their owners. 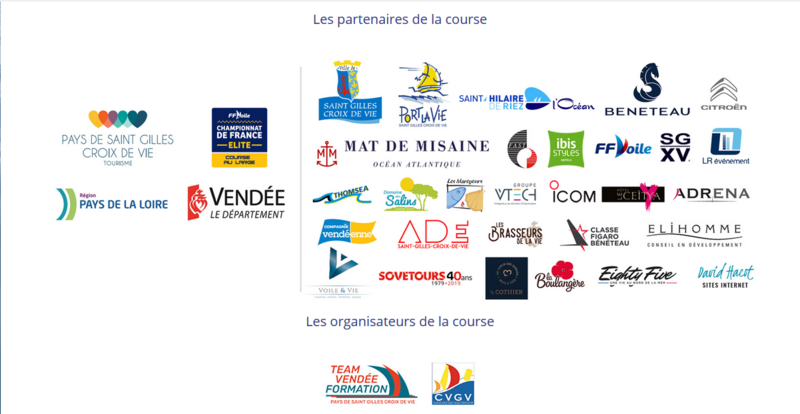 More than thirty sail today, concentrated between Lorient, Port-la-Forêt and Saint-Gilles Croix-de-Vie, where many skippers prepare the first event of the season, the Sardinha Cup (26 March-13 April ). Tip & Shaft has collected the first returns of several sailors (Loïck Peyron, Fabien Delahaye, Nicolas Lunven, Adrien Hardy), but also of Christian Le Pape, head of the pole Finistère race off Port-la-Forêt, Tanguy Leglatin, who heads the training group at Lorient Grand Large, and Etienne Saïz, coach of the Vendée Formation Team. "We are like children at Christmas who discover their new toy". With his sense of the formula, Loïck Peyron summarizes the state of mind of the sailors who, since mid-January for the first served, sail on the new Figaro 3 and learn to discover the subtleties ... but also the problems of youth . "We are all in the process of learning and reliability of mechanics, which is not so simple because it is a series boat," continues the skipper of Action Enfance. Christian Le Pape abounds: "It's a nice boat with problems of youth in terms of finish, but these are peripheral problems, which concern the bowsprit, the settings of the foils, halyards that rub. It's going to take some optimization and a little time on the job site. " More annoying according to the person concerned: "Most of the skippers of the Pole have their boat scanned, they have not noted major differences in the alignment of the appendages, however some hulls are more or less bumpy. For the moment, we can not touch it, but the class will have to find solutions, because some will have difficulty to admit the fact of having a hull less powerful. " As for the performances of the boat, the skippers questioned agree: the Figaro 3, with its foils, its lack of ballasts, its fine keel sail and hull more bulging, does not look easy to walk upwind. "It's very light and there are no ballast, it lacks a little inertia, it will probably have to fight a little more and bar more often depending on the state of the sea", confirms Loïck Peyron. 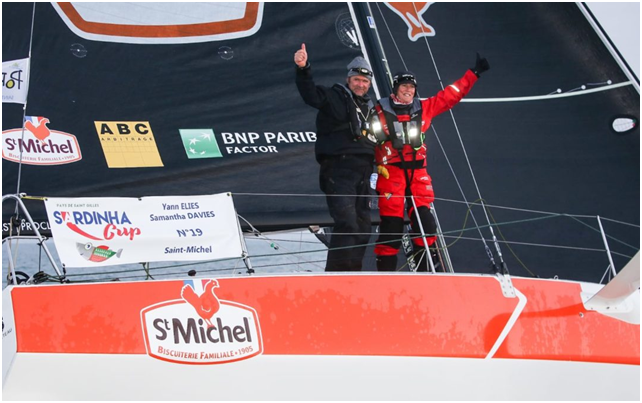 Fabien Delahaye, who sails with Charles Caudrelier in the Hub by OC Sport, adds: "The remittances at the exit of transfer are apprehended differently than on a more classic boat as was the Figaro 2, we must find the hook in the appendages, to get some speed, it's a clever mix that you have to find. " At the pace of reaching and carrying, the VPLP plan is more efficient and more stable than the Figaro 2: "The boat is lighter on the water, it accelerates much faster, it is much more responsive 'is appreciable,' says Etienne Saïz. 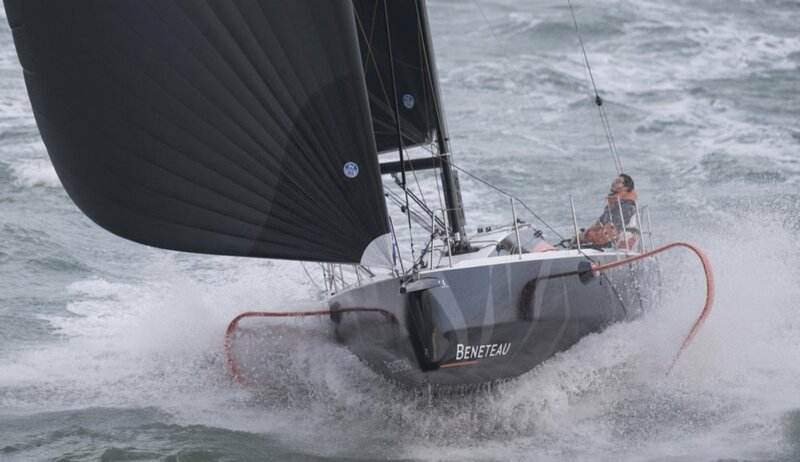 "I think that reaching at 120-130 degrees of the wind, the boat can be faster in the order of 15%, with averages at 14-15 knots," said Tanguy Leglatin, while Fabien Delahaye adds, "We had to reach 20 knots in 25-30 knots of wind at angles of 120-125 without feeling unsafe. These are high speeds that we did not see in Figaro 2 or so in surfs mode a little survival, it is due to the fact that the foil helps to pitch the boat and there is more volume. " 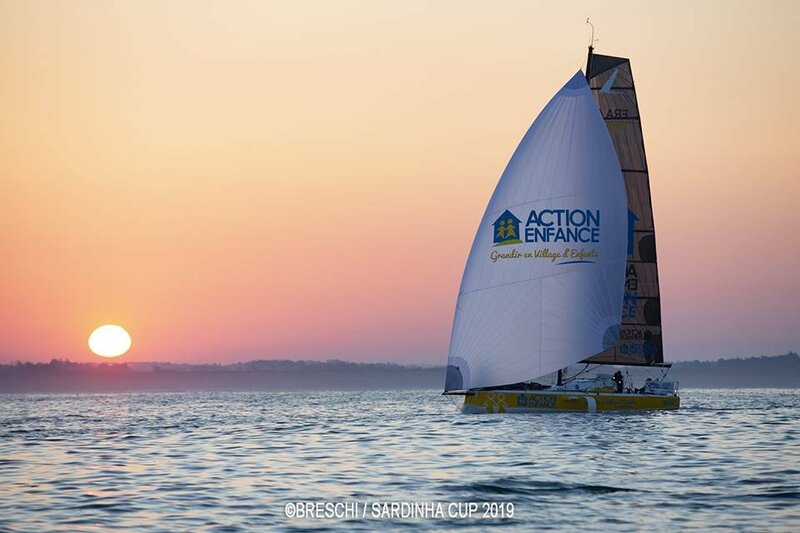 Impression confirmed by Christian Le Pape: "A reaching at 16-17 knots, the boat is" peaceful ", and under spinnaker, it is fast while being very stable, you really have to go to make a start to the pile. On the other hand, it is extremely noisy above 12 knots, because it vibrates a lot. 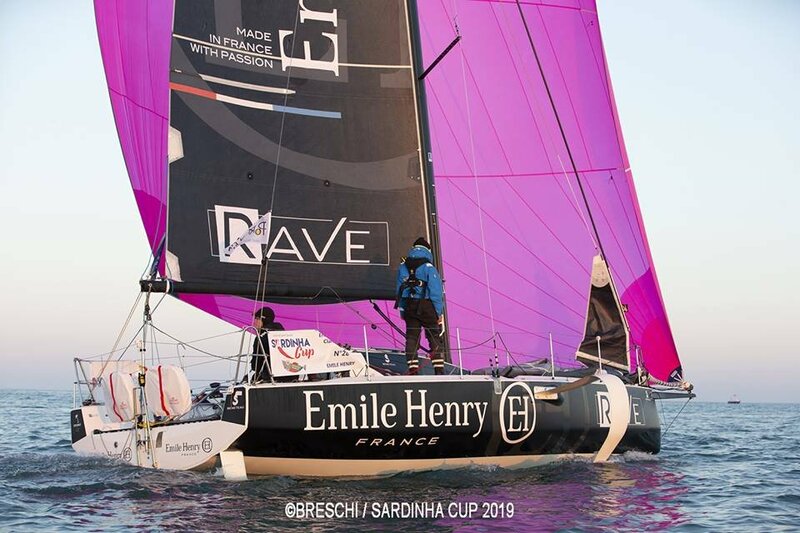 "Adrien Hardy, who sailed with Thomas Ruyant, remains a little on his hunger:" I find that the performance of the boat and the sensations are a little disappointing, compared to what we can live on others boats, Mini type or larger boats. " Among the great novelties of Figaro 3, the foils leave some circumspect, like the same Adrien Hardy: "The foils do not serve much. In the settings, we try more to erase them, to make sure that they disturb us as little as possible, rather than to make sure that they help us. In fact, they will serve beyond 25 knots of wind, rare conditions, knowing that the average wind on the Solitaire is 15 knots. 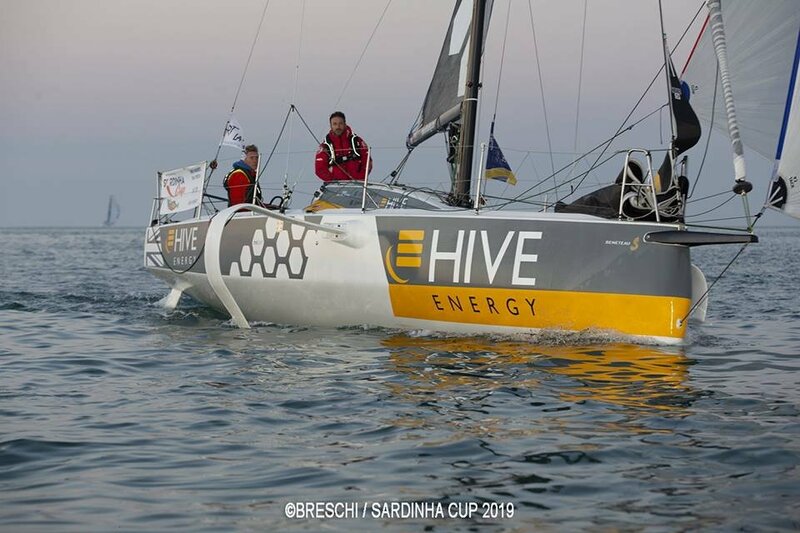 For Etienne Saïz, one of the challenges is to learn how to use these foils in a mode other than lift: "As long as we are below 10 knots, it remains drift rather than foils. After, I think we will realize that they are still very decisive on particular phases that have not yet elucidated. " Another major novelty of Figaro 3 compared to its predecessor, the set of sails: the replacement of the symmetrical spinners of the Figaro 2 by larger asymmetric (121 m2 against 85 for the large spinnaker) and the addition of a gennaker should allow to open the game, especially as it appears already that the various veiled solicited have opted for quite decided choices between versatile and more typical sails. An opening that delighted Adrien Hardy: "The gennaker and the little spinnaker - which we did not use much in Figaro 2 - are real advances that will generate strategies and road choices more different than the Figaro 2 where the trajectories were very straight. " Consequence: some tough choices to come, according to Nicolas Lunven, who will play the Sardinha Cup under the colors of Oman Sail with an Omani sailor: "The asymmetric spinnaker that you can not go down very low wind, it means that when you're going to have VMG bearing edges, where a jibe only created 30 or 40 degrees difference in road difference between two Figaro 2 on opposite edges, that's going to be 60 or 80, that's is consequent, it will make you think. "Etienne Saïz is more cautious about the consequences on the strategy of the new set of sails:" The gennaker opens the field of gaits, but I do not believe a second more play. As soon as they go s' to see that a guy has a range where he gorges themselves, they will all want the same thing as him, it will no longer play on small fine settings. " The performance of Figaro 3, judged by all "more subtle and more technical", will indeed depend a lot, according to our experts, the ability of sailors to find the right settings, which means a lot of time to do his scales. "The boat requires a lot of precision and concentration because it zigzags quite easily, it will take hours at the helm," confirms Adrien Hardy, while Fabien Delahaye emphasizes: "It's a very soft bar, but the lack sensations makes driving difficult, it's hard to feel if you're in real life or in the wrong. " Tanguy Leglatin summarizes: "It's a boat that will value the good trimmer and the good helmsman". But also the sailors who will lose the least time in the maneuvers, an aspect which will also have its importance on a boat judged physically hard, which makes say to the same Tanguy Leglatin: "I think that unfortunately, for the girls alone, that is going to be quite hard, between the handling of the genoa which is quite heavy, a lot of friction in the halyards and the big spinnaker which, when sending, generates a lot of risks ". 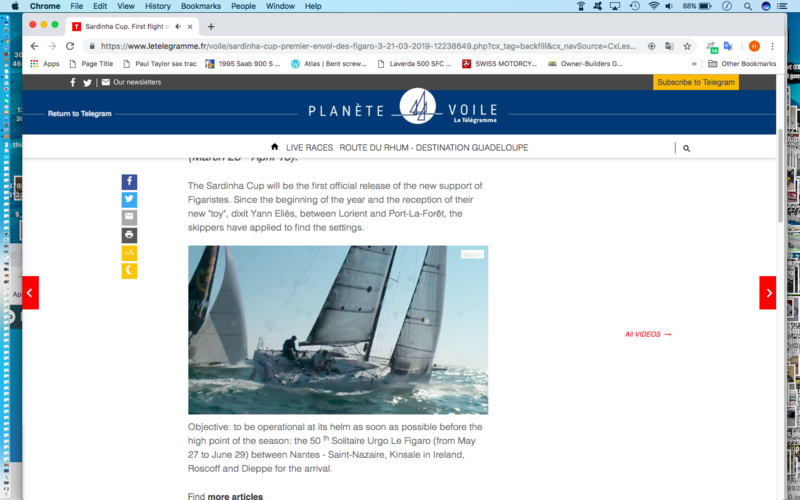 Loïck Peyron confirms: "It's going to be complicated with the asymmetrical spinnakers lying around on the ground, we've already seen a lot of them in the foils, which, at the slightest mistake, are just waiting to chew on the fabric. Maybe that will justify having spinnaker socks, which we have never seen in Figaro ". Last aspect put forward by some: the deck plan quite penalizing for large size, with very low winches located on the sides and no roof winch. 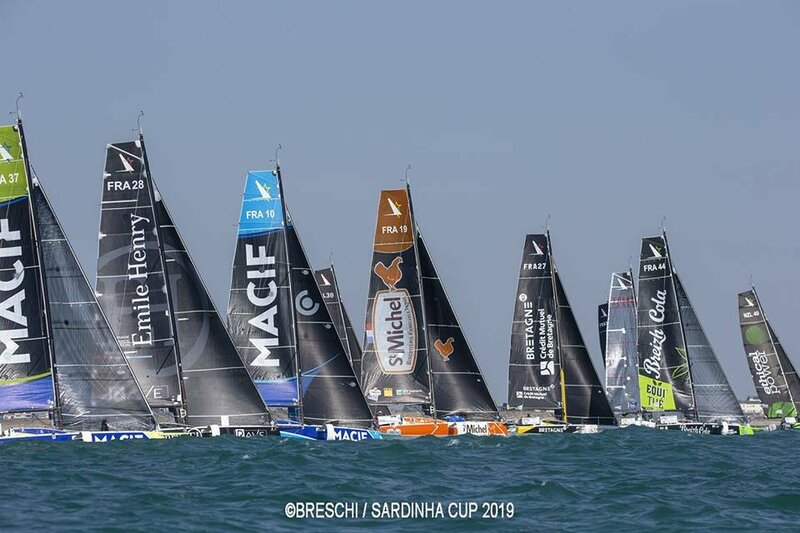 "Maneuvering the boat is not going to be that simple, it will also be one of the criteria to be taken into account this year, announces Tanguy Leglatin, the loss to the maneuver will cost. " The first 45 Figaro 3 were awarded to their owners by drawing lots at the Nautic last December. Biscay is normally not rough for pro sailors, except edge of continental shelf. Downwind angles, enough fig sailors hadenough of going deep too. And DSS better ? No proof, and this is still learning curve. ps, Tip&Shaft is now in English too. Guys, Tip & Shaft is in english for 4 months now. Looks to stand up pretty well. Hey, is there a practical reason why the some of the foils are orange? Is this just a personal choice or is there some traditional/historical significance? I know about "orange is fast" but that is not a real, practical reason. Seems like white is the best option. Serious question. Just wondering what the genesis for orange was. Orange (or at least some fluo color) is part of the Imoca class rules for the rudders and keel (following the capsize and search of I forgot who), so a kind of "tradition"
Okay, thanks. That makes good sense. Fluo is also mandatory in Classe Mini and Class40 for transatlantic races. I would really like to see the IIs line up against the IIIs. I notice that the skippers are jerking the tiller back and forth in nearly every segment of the video. We've definitely seen this in other videos as well as others have noted. In the Tip & Shaft article it was mentioned: "The boat requires a lot of precision and concentration because it wanders easily, it will take hours at the helm,"
I wonder if this is because of the vertical part of the foil being short from front to back. I wonder if an autopilot will be able to handle it in these conditions. It's still got a keel. But I would surmise that the CLR is moving about dynamically as the boat lifts/changes immersion of the foils. You would think that an important part of the brief for a singlehanded boat would be to behave well when under autopilot and not require an expensive solution of pilot/software/sensors to compensate an unnecessary problem. any half decent boat should look good in those conditions. I am still far from convinced. Right at the 59 second mark. One of the key purposes of the foil (or at least the DSS foil) was to reduce any of this bouncing. I wonder if it is all related. 30 footers do pitch a fair bit. It's sailing under main and jib only - virtually every boat under 35ft is going to have that sort of tendency even in light upwind conditions. A nautical architect can explain why but trying to scrutinize the Figaro 3 based on some promotion drone videos during this early process where everyone is learning and trying to figure it out is like taking a picture of a fighter jet landing on the ground and saying look it can't fly because it came down. Looks like the video playback speed (frame rate) was not consistent through the video. When sped up, the pitching looks more extreme. Minis pitch much worse and they use off the shelf pilots. I sail an ultralight 30 foot boat and it has never bounced like that. I believe that the foil can be trimmed. Am I correct on that? The video would indicate that it is not properly trimmed at the moment. But I believe I read the French correctly that this is their first time out on the boat, so would need to learn how to work it. The video is sped up for most of it. It is not a data point with regard to pitching rate. You really think so? The water/spray on & around the boats seem to be acting at normal speed. Yes. But the vid temp is for sure played with, editor forgot the original speed I think. Happened to me once too with a vid. And count wave pattern, way to fast. Of if real, very strange and boat responds to waves, so that is normal. My bet, speed is off. But when you think about 30 or more boats on this double handed race coming up, and maybe up to 40 or 50 in the Figaro, by the very nature of the racing there is contact the last you want to have with small boats with small budgets is contact between boats with foils. It is not pretty and it is expensive. At the end of the day you have to ask if the foils are worth it, but it is – I guess – if it helps the teams find more commercial interest. The boats require a lot of time on the helm both upwind and downwind, it is going to be tiring and that will be a challenge. This echos my concern that at $15,000 per foil, sponsors are not going to be happy if a foil is broken. And his comment about a lot of time on the helm reiterates what has been said above. Lots to think about. Silly Rabbits, it doesn't matter how fast it goes or how tiring it is to sail or how they will wad them up with the smallest contact. They have FOILS therefore they are better than everything else. Silly rabbits. IN the same article of Tip&Shaft a good explanation why the FIg is popular. Seriously I've sailed lot of lightish 30 footers and they do pitch. Going downwind with the kite up in breezy conditions sometimes they feel like a car with broken suspensions. Figaro always went for sturdy boats, not the pinnacle of design, this design is actually very forward for the class. Media savvy Clarisse, as she did in the mini, good for the adventure feeling between the professionals. Will bring young new fans to sailing I hope. And as a former rugby player she's actually willing to put in the hard work and focus to get good results despite relatively new to the scene. and many of the top French sailors and quite a few other nationalities. Thanks to Breschi for some lovely photos on the FB site . 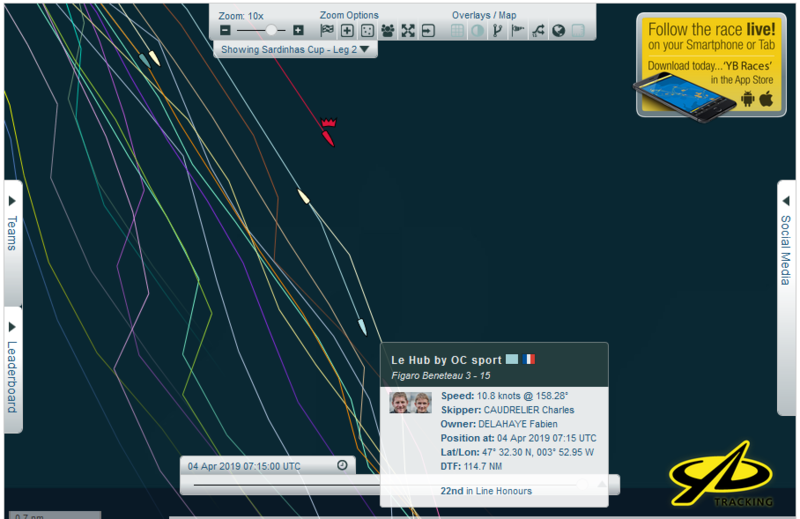 Looking at the tracker, close racing, split in a leg for coast or offshore, but in the middle had the most advantage. 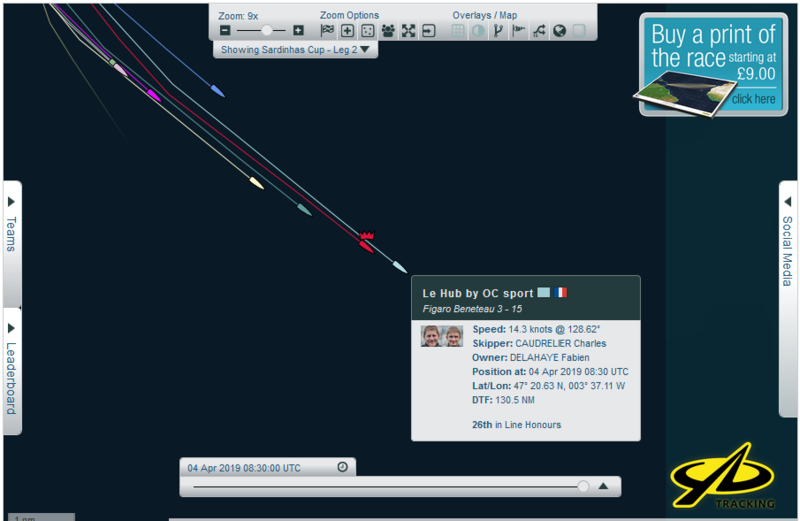 Pity about the tracker which sees to have the lead boat in 22nd place and total confusion behind! Charles now in 26th! Must be a bit disappointed. An impressive list of entries. sounds like the third race is cancelled because they need to replace the spreaders for the entire fleet. Bit of a testing time for the new fleet. Two interesting reads from the news on the race website today. That’s going to be expensive! Who is the rig supplier? Can't help they'll be taking a good look at the mast spec as well. 30+ teams racing doublehanded probably pushed things a bit harder too. Apparently it is "just" the connection between mast and spreader that is poorly designed. The article also mentioned the leaking foil boxes. This was a big problem for the F-3 in last summer's Transpac. Apparently it leaked a lot! WTF were they made in china ? Nothing to do with the world's factory. Poor access hatch selection/ fitout integration work. Early boats were all basically using standard plastimo access hatches that are IIa - problem is hatches are designed to be installed on top or vertical - not upside down. If they were to do it all over again - probably would have opted to create flush access hatches on the deck mold and not have any openings to the interior via the foil casing. I don't think it's indicative; when the J24 first came out the rudder gudgeons and spreader brackets both needed to be beefed up. What happened with the spreader thing? We really need somone on the docks to keep us up to date. I think that they've dismasted all boats to sort it out. They pulled all the rigs, new spreaders (not sure if new spreader bars too) rigs back in and racing the third leg of the Sardinha cup right now. Hard to believe that they had that many spare spreaders and got them modified in such short time. I cannot for the life of me figure out why there are just some people who keep throwing out DSS as if if they whisper it enough it'll somehow catch on in the market or earn royalties. The Figaro 3 is a faster boat than the Figaro 2. It is different yes - some people will lament the lack of water ballast, but *shrug* the participation from big programs is the strongest it has been in some time. You wouldhave to see the 2 race against the 3 in all sorts of conditions to decide overall which is faster and I don't think that has happened yet, but the people I have spoken to who are currently sailing North up the East coast of the Bay of Biscay all have had a lot of experience with the 2 and all seem pretty happy that the 3 is fast enough and fun to sail. Quite a challenge to get the best out of, and a bit wet in foul weather! My understanding is that the boats sail with the foils fully extended in all conditions so, if true, future iterations might bypass hull penetrations, access hatches & adjustability in favor of a rigid/fixed foil integrated across/with the hull. Or perhaps a recess into with the foil sets for ease of transport, storage & replacement. Yann Eliès et Samantha Davies ont coupé les premiers, samedi à 7h25, la ligne d’arrivée de la Grande Course n°2, troisième étape de la Sardinha Cup. Les deux skippers de StMichel font coup double, puisque cette victoire leur permet de remporter cette course inaugurale du Championnat de France Elite de course au large, première épreuve du nouveau Figaro Bénéteau 3. 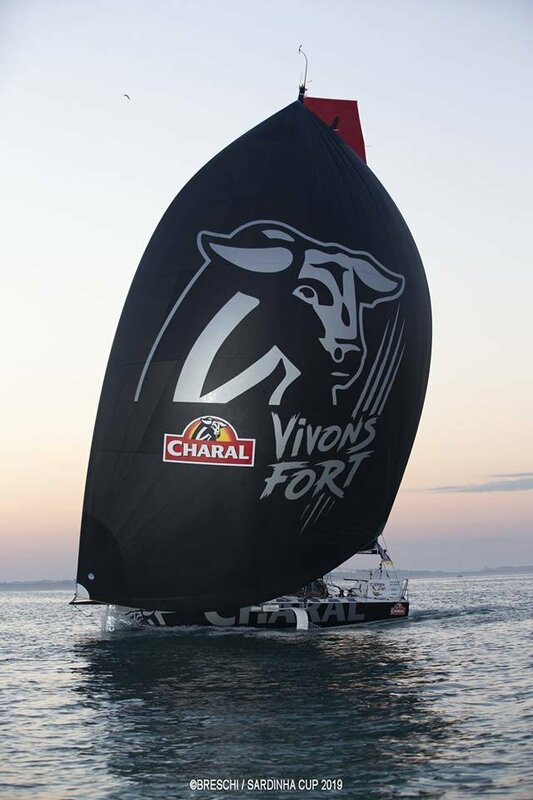 Septièmes de la Vendée Warm-up, quatrièmes de la Grande Course n°1, le Briochin âgé de 45 ans, triple vainqueur de la Solitaire du Figaro et deuxième de la dernière Route du Rhum-Destination Guadeloupe, et la Britannique de 44 ans, qui décroche sa première victoire sur le circuit Figaro, ont offert un véritable récital sur cette troisième étape, prenant les commandes de la flotte dans la descente au portant vers Arcachon avant de creuser l’écart lors de la remontée au près vers l’île d’Yeu et de s’imposer au bout d’un jour 17 heures 35 minutes et 23 secondes. Cette troisième étape a finalement été raccourcie de 322 à 280 milles.